Do you ever have one of those evening where you are counting the minutes until you crawl into bed; bed time finally rolls around and all of a sudden you are wide awake? No matter what you try you just can’t get to sleep? That was my night tonight. Counting the minutes to bed time turned out to be a very productive time for me. I have laundry drying right now because I was trying to keep busy and for whatever reason my brain thought laundry would be fun. 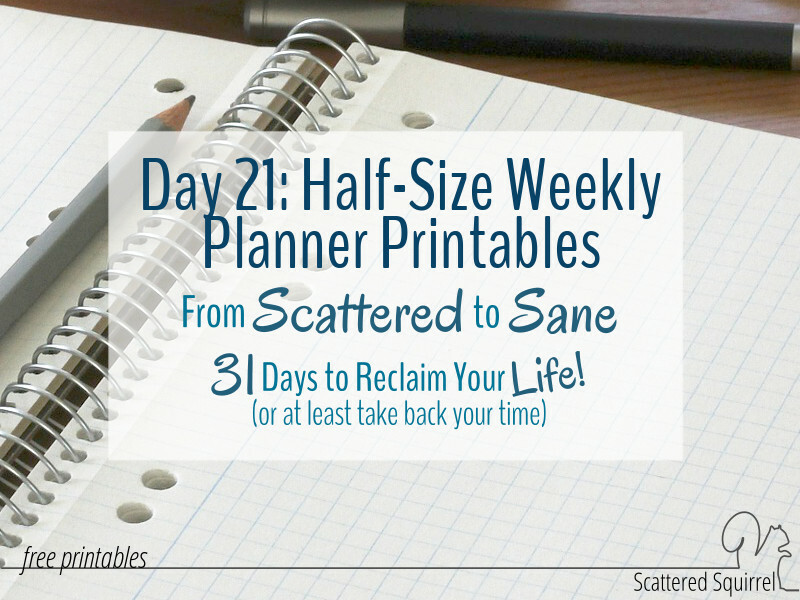 I cleaned the pet cages, prepped school lunches and, I put all the finishing touches on the half-size weekly planner printables. Whoop!!! I know most of you are probably sleeping all ready, but it’s 10:30 pm here on the west coast and I’m wide awake so I thought I’d take advantage of the quiet and hop on here to share the new printables. This way they’ll be waiting to greet you in the morning. Like many of the printables I’ve shared over the years, I opted to keep the new weekly ones fairly simple. They were designed to fit in with the 2016 calendars and so you have your choice of six different colours. Or you can do like me and print all of them and match them up with the monthly ones. On the left hand side there is an area to jot down your top three things for the week, and under that you’ll find space to jot down your focus or goal for the week, followed by a space for notes or lists. In the day columns I made a section at the top for those who like to plan their meals. With a quick glance you can see what’s on the menu each day. Under that I left it simple and unstructured. You can easily use washi tape, markers, highlighter, stickers, post-its or other planner supplies to customize these pages to suit your needs. 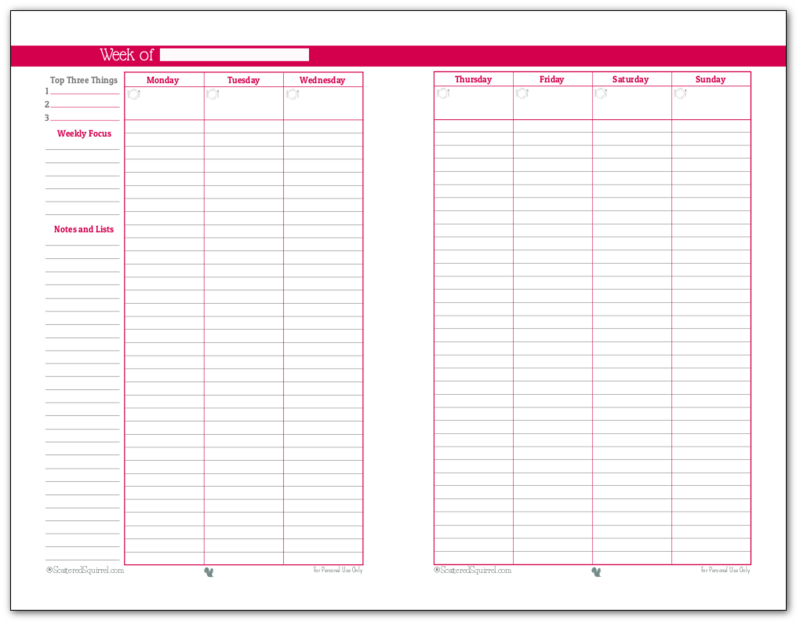 With these planner printables I really wanted to try to come up with something that wasn’t too structured or confining. While more structure can be a wonderful thing, sometimes it clutters up a planner. I find that the half-size printables are more prone to that visual clutter, simply due to their size, so keeping the design clean was top priority. Are you ready to check them out? Just simply click the pic of the one (or ones) you want to snag a copy for yourself. All in all, I’m really happy with how these ones turned out. Not only do they match the 2016 Calendars, but they fit in nicely with the new daily ones as well. 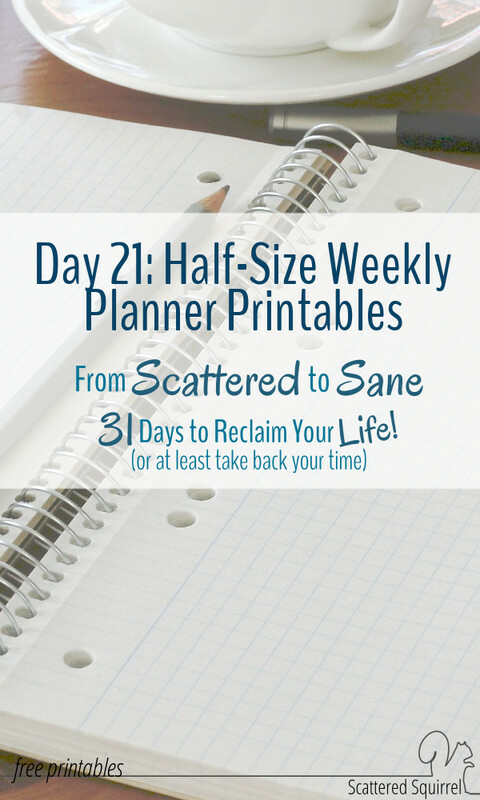 I’d love to hear what you think about these new half-size weekly planner printables? To simple? Not simple enough? Hi Alli! I absolutely love your printables and have been using them for 2 years. 2016 are the most beautiful yet! I have never been able to use the weekly pages because I find them too small for all the stuff I have to write in. I am a mom x6, just finished nursing school, work full-time and am currently working on my BSN. I have been trying to make my own pages but they aren’t near as pretty and look cheesy. I’m not able to copy and paste a picture for some reason. But here is the jist. I use the 1/2 size notebook paper and put Sunday, Monday, Tuesday, and Wednesday on the left hand side. I put Thursday, Friday, Saturday and an inspirational quote on the right hand paper. This gives me plenty of room to write assignments and everything else going on. I would LOVE if my pages matched your calendar pages! If you ever have time…. I really love your family schedule on one day, but its only available in full size. Is there anyway you can make that into a half size sheet? I use a FC Compact size (4.25 x 6.75) and I can size down from a half, but full gets a little complicated and wastes a lot of paper. Thanks so much. I can’t figure out how to view the printables. I click it and nothing happens. Am i just being a blonde or is their something i’m missing?